The Energy Standard Club, owned by International Swimming League owner Konstantin Grigorishin, announced last week that it will field an ISL team, and included five initial big-name signees. Those signees were Femke Heemskerk, Ilya Shymanovich, Danas Rapsys, Emily Seebohm, Kierra Smith. Click here to read more. Grigorishin is the leading shareholder of the Energy Standard Group, which sponsors the Energy Standard Club swim team. He’s been the main face (and financial backer) of the International Swimming League, and will now own one of the four European clubs in the league’s inaugural season. Thursday, the club announced the signing of seven more athletes: Anton Chupkov, Evgeny Rylov, Fantine Lesaffre, Charlotte Bonnet, Rebecca Smith, Andrei Minakov and Kayla Sanchez. Note: Minakov and Sanchez will not receive any money – Minakov is an NCAA athlete at USC, and Sanchez is only 17 and could still have an NCAA career ahead. 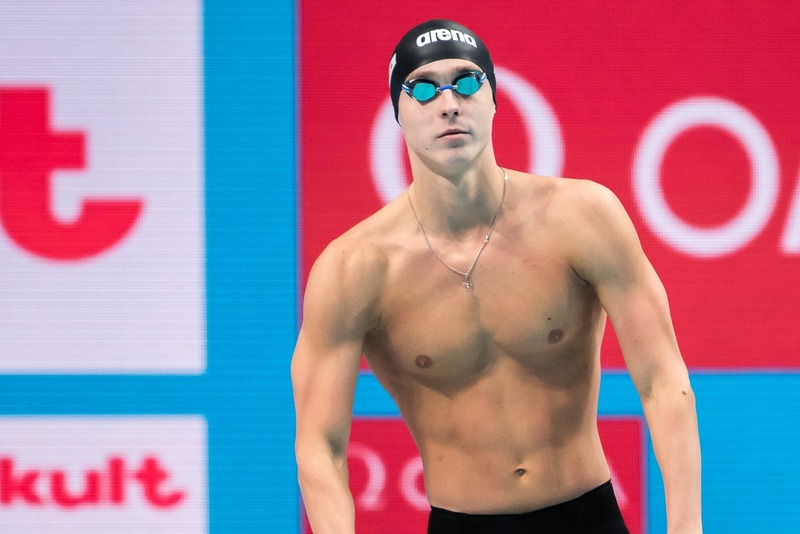 Chupkov won a bronze medal at the 2016 Olympic in the 200 breast, and is a multi-time Worlds medalist, including gold in the 200 breast in 2017; Rylov was the Rio bronze medalist in the 200 back and won gold in that event at the 2017 FINA World Championships; Lesaffre was the 2018 European Champion in the 400 IM; Bonnett was the 2018 European Champion in the 200 free; Smith made Canada’s 2017 Commonwealth Games team; Minakov is a world junior record holder, and Sanchez also was a member of Canada’s 2018 Commonwealth team. We have another group of athletes to announce to you today that will represent our team at the 2019 @iswimleague ! . . First today we have @lobeeeen 🇷🇺- welcome to the squad! Our second swimmer of the day – welcome @fantinelesaffre 🇫🇷 to the squad for @iswimleague 2019! Next up today is @evgen.rylov2396 🇷🇺 who will rejoin our squad after swimming with us at the 2017 @energy_for_swim_official – welcome to the @iswimleague 2019 team! Next up for our @iswimleague 2019 squad is @chachabonnet 🇫🇷! . Welcome to the team! Another athlete joining the team for the @iswimleague 2019 season! This time we are back to North America with @rebecca.smith14 🇨🇦! . Welcome to the squad! Our next swimmer is one of two amateur athletes we are announcing today who will swim with us at @iswimleague 2019. Welcome @andrei_minak 🇷🇺 to swim for team points with us! Our final athlete announcement of the day is also an amateur swimmer competing for team points at @iswimleague 2019 – welcome @kaylasanchez_ 🇨🇦 to the squad!